Remember That Chrysler Turbine Engine For Sale? 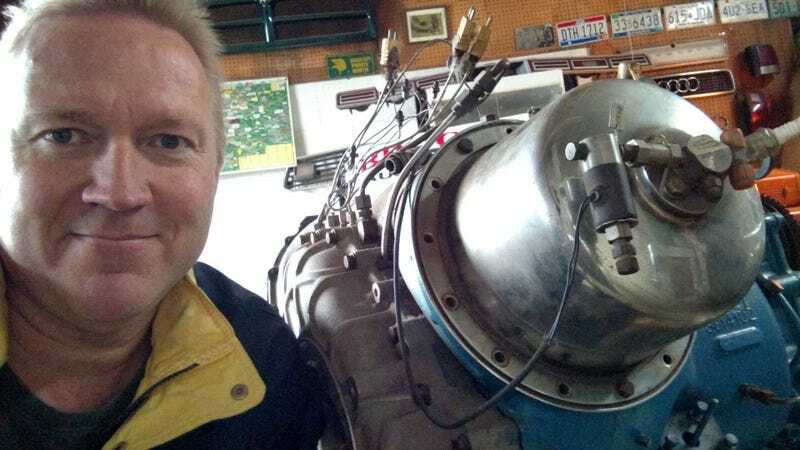 A few weeks ago, the internet was atwitter about a Chrysler Turbine engine which had popped up for sale on Ebay. Articles were written, speculations abounded and . . . nothing happened. So, here’s the story. The first week of April, a 7th generation Chrysler turbine engine was listed for sale on Ebay. I got bombarded with emails and notes because I have written a book on the Chrysler Turbine Car project. Soon, articles started popping up as well. Many of them were - how shall we put this? - imprecise. One article said the engine was to be placed in a Chrysler New Yorker. Another said the engine was intended for production. Several hinted it could be made to run quite easily. Some ran with the production figure of seven (as in, this was one-of-seven built) although this was not necessarily the case. The program called for Chrysler to provide at least 7 engines for the program (which was a joint operation between Chrysler, the DOE and NASA) but they very well may have made a few more. You know: just in case. For a quick run-down of the Turbine Car program, see my low-budget video (11:00 for this engine). The cover shot there is of the 4th Generation turbine being installed into the most well-known of the Turbine cars at the Greenfield facility. Now, fast forward to today. So, the turbine was on Ebay and the pics looked good. A friend of mine asked me if I would take a look at the turbine engine for him to see if it might be worth bidding on. I contacted the seller and arranged a visit. The seller is a very nice gentleman who runs a salvage yard in metropolitan Detroit. I drove over and walked into his office. He was behind the counter and the engine was in the corner. There was no mistaking it: It was a 7th generation turbine engine. He rolled it out into the middle of the floor so I could walk around it and he even unbolted the transmission housing he had added (which was not original to the engine). He told me the story of how it came into his possession and it made sense. A while back Chrysler had scrapped a bunch of stuff from one of their facilities and the turbine was in the mix. Someone had the foresight to grab it and put it indoors while everything else was thrown out back. The engine does have fittings and things which clearly indicate this was one of the engines used for test purposes. (Three were placed in cars and four were run in test cells.) It showed a little damage on its underside where it had likely fallen or been dropped. It was also missing a portion of the intake. But, everything in the turbine appeared to be interconnected and to turn freely. This is important as some of the turbines Chrysler disposed of back in the day had parts removed from them to render them incomplete. I took a bunch of pics (and a selfie, of course) and thanked the owner for showing it to me. I passed the pics along to my friend who decided to not make a bid on it when the bidding passed $9,000. Them something strange happened: the seller pulled the listing. It has since been relisted a few more times but as of this writing (4/26) the turbine engine is still listed for sale. It has a Buy It Now price of $25,000. I’ve had several people ask me what I think the engine is worth. It’s hard to say. I doubt anyone could get it running without a ton of know-how and money and the estimate of how much money would also require a ton of know-how (after tearing the engine apart and figuring out what was there and what was not). Most of the parts inside this engine were unique to this engine and would have to be fabricated if need be. Some of the mundane things like seals could also prove deceptively expensive. I personally thought I’d be willing to pay $7,500 or so for it. Not to do anything with it but to just stick it in my living room and look at it. But I suspect it will sell a little north of that. How far north? Check out the listing from time to time and maybe we’ll find out one day.